Since its entry onto the make-up remover market, micellar water is continuing to win over new disciples. Initially sold in pharmacies it is now on the shelves of large retailers. It’s simple: micellar water practical, effective and gentle, so meets the needs of today’s women. It is practical as it offers dual-action cleansing and make-up removal in one. It is also a no-rinse product which removes make-up in record time. Effective as it contains “micelles”. These are small spheres compatible with water and oil which act like magnets to capture impurity, make-up, excess sebum and pollution on the skin’s surface. Gentle as their formula meets the needs of the most sensitive skin. Micelles are not harsh on the skin which is why there is no need to rinse. Moreover, there is no need to rub; they are gentle to use. As such micellar water has become a bathroom staple. 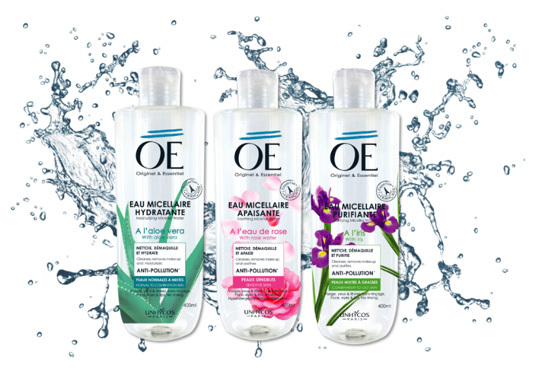 Because all skin types need care, Oé has developed micellar water formulas to meet the specific needs of each skin type. The benefits: Oé micellar waters free the skin of pollution. They eliminate the pollution particles on the skin’s surface and contain an active anti-pollution ingredient. This active ingredient is a breathable film on the skin’s surface that acts as an effective barrier offering total protection against pollution and UV rays. Oé micellar waters: Free your skin from pollution! Our Hydrating Micellar Water is formulated for normal to combination skin and enriched with aloe vera. It leaves skin feeling fresh and soft. Our Soothing Micellar Water is enriched with rose water for sensitive skin. It leaves skin feeling soft and soothed. Our Purifying Micellar Water meets the specific needs of combination to greasy skin with its iris and zinc-enriched formula. It leaves skin feeling fresh and healthy. Oé micellar waters turn make-up removal into a moment of pleasure.